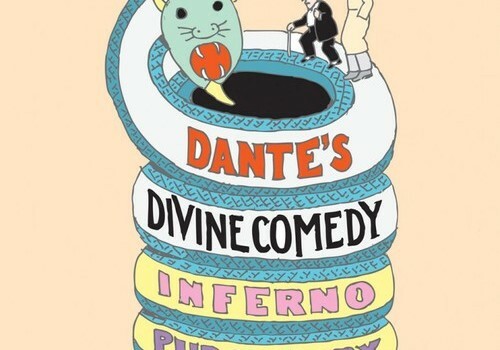 Dante Alighieri’s epic poem has been reinvented, referenced and recycled so many times over the years that most people will have a good idea of what Dante’s passage through hell, purgatory and paradise entails whether they’ve read it or not. But few iterations are as downright fun as Seymour Chwast’s graphic novel adaptation, an accessible adventure that depicts Dante’s opus by way of Mr Benn, outfitted with 20s/30s fashions and Thommy gun-wielding gangsters. While this is Chwast’s first graphic novel, the so-called “left-handed designer” – perhaps best known for his work via Push Pin Studios – has always exhibited an inimitable playfulness, and his sense of humour translates remarkably well here. The book begins with a brief introduction to Alighieri’s conflicted life and a map of hell that feel as though they’ve been torn from an educational booklet. Indeed, the book does at times feel like an accessible introduction to Dante’s masterpiece, one that captures the spirit if not the mood. Even the Third Circle of Hell, wherein the once gluttonous now spend eternity wallowing in their own waste, is presented in a manner both ironically family-friendly and wholly unsettling. Despite the book’s jovial tone, Chwast stays faithful to the source material, slavishly at times. I personally would have preferred an updated script to better compliment the 19th century stylings. The residents of Hell and Purgatory that we meet are all those mentioned in Dante’s original text; many of them were religious leaders publically opposed by Dante and responsible for his subsequent exile. A few “cameos” from greatest history’s sinners and saints post-1321 would have better complimented the book’s reinvention and truly lifted this particular adaptation from the stack. While reading Chwast’s oddity, I was frequently reminded of Dante’s Inferno, the recent video game adaptation of The Divine Comedy’s first act; a lavish interactive experience whose developers were so preoccupied with designing Hells’ ghastly landscapes and demonic denizens that they seemingly forgot exactly what it was they were adapting. 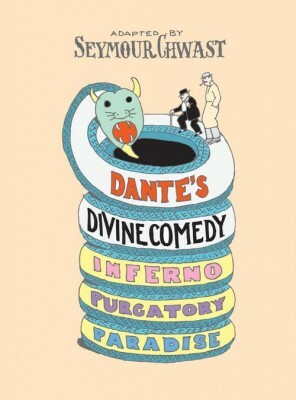 Chwast’s adaptation is almost that video game’s antithesis; a refreshingly impertinent adaptation that suitably captures Dante’s work within its crude but charming doodles.